First, you need to sign up for a Twitter account, which you can do easily at www.twitter.com. -This guide assumes that you have a basic familiarity with Twitter, but if you do not, please go here for a short guide to Twitter for historians. Once you have set up your Twitter account, make sure that your account is not private and that your tweets are not protected, at least for the duration of the conference. If your account is private, others will not be able to see your presentation. Each individual is responsible for presenting their own paper from their personal Twitter account. However, the @ASEHGradCaucus account will introduce each paper. The @ASEHGradCaucus, @ASEHResources, @NiCHE_Canada, and @NiCHE_NS will also retweet the first tweet of each paper and the resultant Twitter moments, respectively. It is strongly recommended that you plan your tweets ahead of time in a Word Document or similar program. Participants are allowed between 8 to 10 tweets for their conference paper. These tweets can be text-based (within the 280-character limit), consist of slides and/or graphics, or combine both approaches. Links are also welcome. We recommend that you space out your tweets. You should try to aim for one tweet per minute or minute and a half. The first tweet in the thread *MUST* contain the conference hashtag #ASEH2018Tweets. We also recommend using #ASEH2018 (main conference hashtag), #envhist (general environmental history hashtag), and any other relevant hashtag the presenter might want to choose. Your very first tweet should be the title of your presentation. Your last tweet should include a link to additional resources/reading or a place where folks can learn more. All presentations must be presented in one Twitter Thread. Send your first tweet with your title, opening information, and required hashtag(s). 2. Click on “add another tweet” and enter your second tweet. 3. 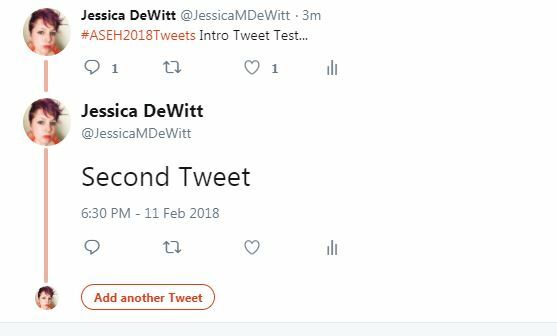 Continue “adding another tweet” until your presentation is complete! Since this is a conference like any other, we would encourage you to interact with other people as much as possible! There are several ways that you can do this. Talk about the conference and the presentations you’d most like to see, including shout-outs to those presenters using their Twitter handles and the conference hashtag. Feature Photo: Riverside by Owen Allen.